Thanks to the Hambletonian Society we spent Friday, Aug. 3 and Saturday, Aug. 4 on site at the Meadowlands. We thank Tom Charters, Moira Fanning and the entire society’s board and staff for being able to represent the TwinSpires wagering public by being members of the international press crew covering one of the greatest programs in the harness racing season. 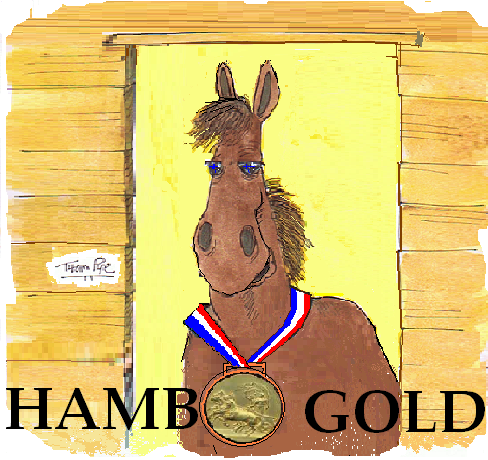 A complete, exclusive story about the Hambletonian race for 2012 will be available at the Hambletonian Trail blog. The two features on Friday night started us off with strange twist concerning the next day’s trotting classic. In the Townsend-Ackerman, which consisted of trotting colts that did not make it into the main event for one reason or another, we praised Little Brown Fox. He was the colt we thought would win the main event but he broke in his elim and did not make it into the final. When this race surfaced we alerted our readers that no price may be small enough that couldn’t be considered an overlay because he would win this minor event. He won, paying $2.40 (the favorite exacta paid $3.80, the trifecta paid $7.60), but he won stronger and faster than the Hambletonian winner the following day (see “Trail” blog). “Fox” won in 1:52, gliding away from his foes, none of which had muscle enough to stay with him. We tweeted a cold exacta win Friday night in Race 8. Sniper Seelster to Lemon Drop Hall paid $34.40. In the Ima Lula stakes our 7-1 Tui was in the race until buried late, finishing seventh. The big favorite, Cedar Dove, won. It was a curious day for favorites and longshots at the Meadowlands on Aug. 4. We stuck with most of our published choices but made an update in the Sweetheart Final that turned into a profit (we hope you followed our tweets). We backed Jerseylicious over our original choice, Cult Status. Jerseylicious won and paid $20. Cult Status finished third and the other horse we mentioned, Nikki Beach, was the huge favorite and finished second. It was indeed delicious in Jersey to find that a triple with those elements paid $123.80. Our only other winner was published in the blog. That was Aperfectyankee, who won the Peter Haughton Memorial Final and paid $10.80. Fashion Blizzard, our second choice, finished third at 8-1. Martini Hanover was third at 13-1; Rollinlikeabigshot was third at 6-1; Starglow Hall was fourth at 78-1; Blackjack Princess was fourth at 3-1; We Will See was fourth at 3-1; Lady Rivera was seventh at 9-1; Zooming was seventh at 6-1; Higher And Higher was eighth at 82-1; Hot Shot Blue Chip broke and finished seventh-placed sixth; and Southwind Moni broke and was eliminated at 47-1. On a $2 basis, if you backed every favorite (just to win) on the Hambo program, you lost $2.40 (a negative ROI). On a $2 basis, if you backed every horse we gave you (just to win), you made $6.80 (a positive ROI). The countdown to the 2012 edition of the Sobeys Gold Cup & Saucer continues as Charlottetown Driving Park presents the event on Saturday, Aug. 18. We will offer our analysis of the event and the programs at this blog for TwinSpires exclusively. Rebounding from his Adios failure, Sweet Lou overpowered his Pennsylvania Sires Stakes division Aug. 4 at the Meadows in 1:49.4. The $290,937 event for soph-colt pacers found Sweet Lou sporting new gear and the 1-9 favorite soared to the win by 3-1/2 lengths. A notable record from a losing horse in the New Jersey Classic occurred on the Hambo program when Hurrikane Kingcole took the front and guided the field to three-quarters in a blazing 1:18.2. The prohibitive favorite, he was beaten by a head, unable to take one more step to complete the 1:47.2 mile. The winner, Panther Hanover, gets credit for the time but, as in many world-record performances, the pacesetter cutting the fractions, in this case “Hurrikane,” was right there to share the time. It was only a :29 final panel with that three-quarters time, which was the fastest three-quarters time in the history of standardbred racing. The Meadowlands’ Bob Heyden was on the simulcast show Friday and picked a horse that was 20-1 on the morning line. Most Happy Keene, leaving from the 10 hole in Race 11, with Anthony Napolitano driving (a mainstay at Pocono Downs with a few drives on the evening program), had a minor class edge in the conditioned event but his form looked awful. The race, however, presented some dueling and shuffling, enough to allow “Keene” to close five wide and catch a row of horses to win. The “Holly Hot shot” pick paid $88.20. So you see, not all of the in-house handicappers make keen decisions, no pun intended. 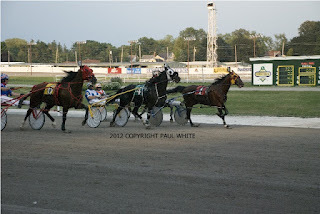 Racing at Batavia Downs moves to a Sunday afternoon – Wednesday – Friday and Saturday night schedule beginning Aug. 5. Evening post time is 6:25 p.m. with matinee post time scheduled for 1:15 p.m.
Get onto our mailing list and receive a free copy of a classic horse-racing fiction book by clicking here.